If you are interested in writing a story featuring City Dogs Rescue, please contact us for more information. "Your Afternoon Animal Fix – AdoPtville"
"Home in DC for the holidays? City Dogs & Kitties Rescue needs you to foster a dog or a cat"
"Road to a Better Community: City Dogs Rescue"
"Dog adoption fair held in National Postal Museum in Washington DC"
"DC area dog adopted from City Dogs Rescue participating in Puppy Bowl"
"Buttons, Mr. Wigglesworth and Jennifer Pawrence: ‘Puppy Bowl’ lineup announced." "Displaced pets from Hurricane Harvey — and now Irma — need our help"
09/07/17: Featuring David Liedman and alumnus Bentley from City Dogs Rescue & City Kitties. "This Rescue Dog Asks That You Please Watch The 14th Annual DC Shorts"
"Introducing the Real Shelter Dogs of Washington, D.C.!" 05/15/17: Call it D.C., call it Potomac, call it whatever—just don’t forget to call in some cute dogs! 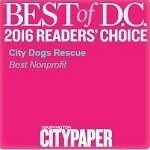 4/17: City Dogs Rescue & City Kitties is voted by readers as "Best Non-Profit" and "Best Place to Volunteer (Runner-Up)" in Washington City Paper's 2017 "Best of DC" Readers' Poll! "Meet the 6 local dogs starring in Puppy Bowl XIII"
02/03/17: Featuring Zoey and Jeffrey aka Burr from City Dogs Rescue. "The Puppy Bowl Will Feature Six Dogs From Washington Rescue Facilities"
​02/01/17: Featuring Zoey and Jeffrey aka Burr from City Dogs Rescue. "Puppy Bowl XIII: Team Ruff vs. Team Fluff"
01/31/17: Volunteer Shannon and adoptable Bonnie and PacMan represent City Dogs Rescue & City Kitties on Good Morning Washington to discuss our participation in Animal Planet's Puppy Bowl. "Lovable pups from local DC shelters"
​01/27/17: Volunteer and foster Nancy along with alumni Anna, Ezra, Jeffrey, Jonathan, Pepper, Maryann, and Ray join Meaghan Mooney on Great Day Washington to discuss fostering, adoption, and Animal Planet's Puppy Bowl. "Two Dogs From D.C. Rescue Group Will Appear In This Year's Puppy Bowl"
"Enter Our Cutest Dog Contest!" Top 10 cutest dogs voted on by Washingtonian.com readers. From those 10, a panel of judges from Washingtonian and our beneficiary, City Dogs Rescue, will choose the winning dog. "National Dog Day: Adopt a Furry Friend"
08/26/16: Volunteers Shannon and Nancy represent City Dogs Rescue on Fox 5 for "National Dog Day." 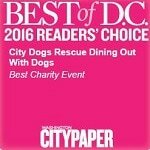 4/16: City Dogs Rescue is selected as the Staff Pick for "Best Dog Rescue," and voted by readers as "Best Non-Profit," "Best Charity Event (Dining with the Dogs)," and "Best Place to Volunteer (Runner-Up)" in Washington City Paper's 2016 "Best of DC" Readers' Poll! "Adopting a Pet Gets Easier, With Help of Big Retailers"
02/09/16: The WSJ discusses City Dogs Rescue's adoption process and quotes Co-Founder Dave Liedman. WSJ Link: Note that you need to sign-in or subscribe to view the full article. Alternative Link: No sign-in required. "'Beth Bacon said her family had to jump through hoops before they could adopt what she calls their “classic mutt.' The 43-year-old Washington, D.C., communications consultant recalls the two-hour application from City Dogs Rescue. Where would the puppy sleep? Would family members be willing to start on allergy medication if necessary? What was their budget for the first year of ownership? The approval process 'was intimidating,' says Ms. Bacon, mother of 5-year-old Caleb and 10-year-old Ella. She and her husband, Jason Freihage, paid a $395 fee, agreed to a home visit from the nonprofit rescue group and were approved to adopt Sandy, a 10-month-old hound-and-beagle mix, in December. City Dogs Rescue arranged the puppy’s trip from North Carolina, and a foster volunteer housed her for two weeks to vouch for her family-friendly temperament. Ms. Bacon says she was happy for “a second opinion” on Sandy’s personality before introducing her to the children." "Adoptive dogs’ needs vary widely, says David Liedman, founder of the nonprofit City Dogs Rescue, which hosts weekly adoption events at local pet stores and places some 600 dogs a year, and City Dogs Daycare. For an adoption to go smoothly, Mr. Liedman says, a family should start preparing long before the pet arrives at the home. Adopting a dog shouldn’t be an impulse move. Yet, he says, 'people expect adoption to be the same experience as walking into a store or ordering off Amazon.'" "8 Placed to Adopt a Dog in Washington"
02/10/16: City Dogs Rescue is featured as one of Washington’s most active pet rescues and adoption organizations. "Puppy Bowl: A behind-the-scenes look at the stuff you don’t see on TV"
02/05/2016: City Dogs Rescue alum Charlie is featured in Animal Planet's Puppy Bowl! "Dog from DC rescue center makes Puppy Bowl starting lineup"
02/05/2016: WUSA9 covers the story of CDR's Charlie, who went from a high-kill shelter to starring in Animal Planet's Puppy Bowl! 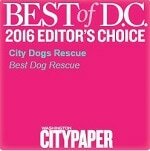 "Give It Up, D.C. Guide 2015"
11/27/15: City Dogs Rescue is spotlighted in a donation guide assembled through Washington City Paper and the Catalogue for Philanthropy for 2015 for high impact, locally focused charities with smaller budgets. "CITY DOGS RESCUE IS CHANGING THE LIVES FOR THOUSANDS OF DOGS"
04/15/14: Story about the success of CDR, plus interviews with fosters and one of our directors. "City Dogs Rescue Washington, D.C. - A Truly Capitol Shelter"
12/16/14: CDR is spotlighted in The Retriever (with the correction that we are actually a "rescue" rather than a "shelter"). "Good Day DC - Adorable Adoptables at the Dogs and Tails Fundraiser"
08/19/14: Reporter Annie Yu discusses Vinoteca's Aug. 24 "Dogs and Tails" Fundraiser with CDR Director Dave Liedman and CDR Smyth County Shelter Coordinator Amy McLean, and she meets CDR adoptable dog Tinkerbell. "The Pet Show with Dr. Katy"
08/02/14: Dr. Katy interviews CDR Director Dave Liedman and CDR Smyth County Shelter Coordinator Amy McLean about CDR's operations, and she meets alumna Marge and sweet foster dog Darby. "City Dogs Rescue Gives Abandoned Pups a Second Chance"
07/31/14: The Washington Post presents an overview of the history and operations of City Dogs Rescue. The Post quotes CDR Director Darren Binder: "[w]hen Dave and I started this in 2011, we figured we were going to adopt maybe two, three dogs a month. Two years later, in November 2013, we adopted out 50 dogs in just one month. So it became something way, way bigger than we anticipated." With its focus on social media as well as socializing, the newspaper calls CDR a "21st-century enterprise." City Dogs Rescue's history and work is covered on the Washington Post's website and in its print edition. "City Dogs Daycare Provides Dog Owners Tremendous Peace of Mind"
7/31/14: DC's MetroWeekly profiles CDR Director Dave Liedman's work with both City Dogs Daycare and City Dogs Rescue. "The Hill's 50 Most Beautiful 2014"
07/29/14: Our own CDR Director Meredith Raimondi, a Hill staffer by day, was voted the People's Choice winner of The Hill's "50 Most Beautiful"! The Hill profiles her amazing work for CDR (she is pictured here with her CDR alumnus Georgie. 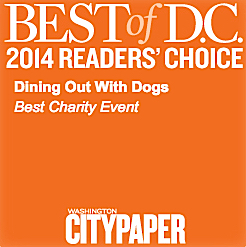 06/30/14: Brightest Young Things covered all things dog in DC, including a small write-up on City Dogs Rescue. "How Facebook Saved 700 Dogs"
05/14: Washingtonian Magazine discusses how CDR has used social media to save over 700 dogs in less than three years. "Many groups are trying to save animals, but what makes CDR stand out is how it has leveraged social media so effectively...."
4/9/14: City Dogs Rescue is voted "Best Place to Volunteer," "Best Charity Event (Dining with the Dogs)," and "Best Non-Profit - Runner-up" in Washington City Paper's 2014 "Best of DC" Readers' Poll! "Best Pet Rescue Shelters in Washington DC"
2/28/14: City Dogs Rescue is listed among CBS DC's five best rescues in Washington D.C.
5/31/13: Darren Binder, one of the founders of City Dogs Rescue, was profiled by his alma mater, Union College in Schenectady, N.Y.
"Pet Project: City Dogs Rescue"
10/15/12: Just weeks prior, Truman had been on death row in North Carolina at the Bladen County shelter. Today, Truman was on TV in Washington, DC! Catch this wonderful clip of our Director Dave and Truman on FOX 5 in DC. "Strong, unbreakable, triumphant Bandit — the rescue story of one homeless dog"
7/12/12: Day in and day out, there are stories of abuse, neglect and pleas to save a life. Amidst those anguished postings there is magic happening which often goes unnoticed — magic like the rescue of a death row dog named Bandit. Inspired by the love of dogs, the Daily Dog Tag focuses on professional dog photography, artful and unique products, and adoptable dogs. See our dogs featured as well as our great photographer James Calder. 6/10/12: Kristin Chenoweth and Maddie's Corner invited City Dogs Rescue to a concert at DAR Constitution Hall. During the concert, Kristin gave us a nice shout-out and we raised awareness about our work to new people in the DC area. Hershey and Sheba joined us! Maddie's Corner is a charitable project devoted to animals and people helping each other. Inspired by and named after Kristin Chenoweth's dog, Maddie, Maddie's Corner was created as a place to celebrate the bond between people and their pets, to help draw attention and support to animals in need and to highlight the many ways animals can help people in need. "Take a Walk: City Dogs Rescue Has New Volunteer Opportunities"
"Borderstan Readers: Thanks for Helping City Dogs Rescue"
"Nellie Dogs: Adopt a Dog Events at U Street Bar"
"Featured Shelter of the Week: City Dogs Rescue"